The Best Crock pot Chicken Pot Pie Recipe - Easy Chicken pot pie! Crockpot Taco Rice Soup – Turn your left over tacos into a second meal! YAY! I am so happy you loved it. I want to make this tomorrow for my husband who loves chicken pot pies and just had surgery on his ankle. But howuch of the garlic salt and poultry seasoning do you add? I don’t really measure. You only need about a teaspoon of each. I just eyeball it. I hope you love it! This was absolutely delicious! I also added a can of cream of mushroom soup and a full can of milk and full can of water. I wanted it less thick, more like a soup. Sooooo good and flavorful! Definitely a new favorite! Oh those are great ideas! I’ll have to try those too! Hmm… mine tends to not be very soup. I would first eliminate any extra water and then if that doesn’t work, I would use a bigger crockpot. I hope that helps! Once I removed the cooked chicken breasts, I thickened it a bit with corn starch. Then added a splash of sour cream and mustard. Chopped chicken and added it back in. Yummy!! Oh that sounds like some great additions. Thanks so much for sharing. Hi, you said to cook it all day, about how many hours is that? 6- 8 hours on low. THanks Jennifer! I made this yesterday. My teenage sons and I loved it! They asked me to make it again soon…. YAY! I’m so happy Salley! Do you cut up the chicken? Thanks! Looks great. I don’t. I actually shred it after it is cooked and then mix it back in. Made this last night, soooo good! I used chicken broth instead of water and it adds an extra savory flavor. I put it in the crockpot around 2:30 p.m. during my lunch break at home and kept it on high… boyfriend came home before me around 5:30 p.m. and said it was practically done, turned it down to the “keep warm” button for another 25 mins, and it was ready for dinner by the time I got back home. New staple favorite of ours, thanks of sharing this! I’am just now making this Delicious looking recipe. .. how many hours if I put it on “high” ? I would do 3-4 hours. Thanks! To make this insanely easy meal even easier, I tossed in a big of the Ore Ida steam and mash potatoes-frozen. Came out great. No need to peel potatoes! That is a great idea! Thanks for sharing. I’ll have to try that. Thanks Gaylin! I hope you stick around for a bit. I made this a week ago! It was amazingly easy and so yummy! Instead of the biscuits I tried a more traditional route. When the inside of the pie (what was in the crock) was finished cooking I poured it into a greased cast iron skillet (you could use a baking dish), placed the pie crust on top, painted egg whites on to the crust, and baked at the recommended temperature; until brown. It was perfect and no one would have guessed how easy it was to make! I am making this for my freezer exchange group tomorrow! Excited to make this tonight! How many people do you think this recipe feeds?? No it doesn’t. I just do that for convenience. You can probably cut an hour off the cooking time if your chicken is thawed. Thanks Melissa! I would say about 4- 6 people. I have 4 young children and it feeds them, mom, and dad. oh Laura, I’m going to have to try that too. That sounds delicious! Yes, I would think that would be perfect to try. Come back and let us know how it turns out. I made this last year and am making it again tomorrow, hands down a favorite and the leftovers are great too! My family absolutly loves this. It costs me way more then $5 but its still a Semi cheap meal. I’m glad you liked it. Of course, I used coupons to help get my cost doen. Made this for the second time today! My husband and two girls (14 & 6) love this recipe! Yum! Yum! I was especially glad I threw it together this morning before leaving for work since we only had 30 mins after work before the next activity. So easy & delicious! Love this recipe! Very easy, cooks well over a long period of time. I was studying (aka cramming!) for finals all day and needed something I could fix in the morning for dinner. I didn’t have cream of chicken on hand so I used cream of mushroom instead with a full can of milk, no water, plus added a tbsp sour cream for a slightly tart flavor (my mom did this for her chicken pot pie filling). I added 1/4 cup white rice flour (gluten free family) to help thicken it even more. I used fresh veggies (potatoes, carrots, celery, onion) and they got so soft and flavorful that my husband ate them right up (he’s a meat and potato guy). I made gluten free bisquits on the side. Amazing combo! Thanks for the idea 🙂 I am terrible with gluten free pie crust but missed that home cooked soul food meal, and this was just as satisfying. WOW! I bought a big package of boneless skinless chicken thighs last week, and a lovely new programmable crock pot. Then I realized that I didn’t like any of the recipes I had for crock pot chicken. I was SO delighted when this recipe came across my newsfeed on Facebook! I’m going to try it as written, but I’m also going to try a version with rice instead of potatoes. 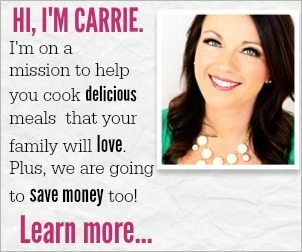 I also think you utterly, totally ROCK for sharing links to various crock pots. And liners? Sweetie, I didn’t even know such things existed, and cleaning the crock pot is the only thing I dislike about having one (arthritic hands make lifting the heavy crock both painful and tricky). I’m ordering some liners today. Thank you! You ROCK! I am going to make this. I can avoid the crust of the pie and choose the veggies to add which will help me with my diabetic diet. I had never thought about making just the middle of the pie and crockpot cooking is even easier. Thank you so much for posting this recipe! I followed this recipe word for word and after making it I suggest not to put the chicken in until the potatoes have been in for a while. Otherwise, you’ll have raw potatoes (even after 8 hours of cooking) and dry chicken. Oh I’m sorry – if you make sure you dice up the potatoes, they cook up nicely. Do you use a large or small can of cream of chicken? I’m making this for dinner tonight. Curious as you don’t specify tho, do you put crescent rolls on top of it in crockpot or on the side when served? I was just gonna cook them in oven. But then I see the drop biscuits so not sure..
Oh my… this recipe is amazing!!! I realized when I went to bake the biscuits, I didn’t have any! First I thought about adding some cooked pasta into it but my little one was hungry already. I ran to my pantry and searched for some kind of carb to add to this (I didn’t add the potatoes) and found a box of Ritz crackers. Wow!!! The crispy buttery crackers made it feel like it had an actually crust! It took the already amazing meal to the next level I recommend trying it next time!! Thank you for this one!! I made this for my parents hoping to entice a bigger meal and something for the freezer. You know it’s good when my sister, who doesn’t Cook much, asks for recipe! Can you freeze this after its been cooked? I don’t plan on adding the potatoes. Does rhe chicken go in first or last? Do you add the chicken raw?? Did not add potatoes. Thickened with instant potatoes at the end. Gives potato flavor and nice consistency.